Leon Lai (黎明), one fourth of Hong Kong’s Four Heavenly King, welcomed a daughter last year with girlfriend Wing Chan (陳泳儀). To not miss the most pivotal years of his daughter’s life, Leon has lessened his workload to spend more time with her. And although Leon is extremely private about his personal life, occasional slip-ups do occur, and the Hong Kong paparazzi will be the first to see it. 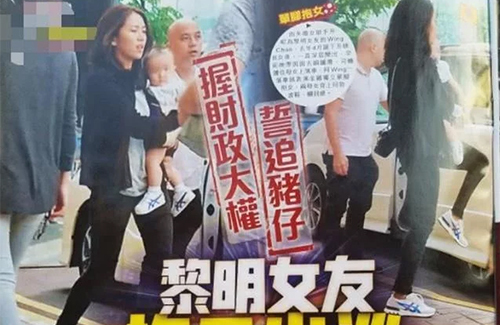 A few days ago, Hong Kong paparazzi managed to snap pictures of Leon’s 9-month-old daughter. She is chubby—like what his father calls her—and growing healthily. It was said that Leon’s daughter was a premature baby, and weighed only 5 lbs at birth. In the span of his 34-year career, Leon confirmed only two relationships. First, it was his ex-wife Gaile Lok (樂基兒), whom he met in 2000 and married in 2008. The couple divorced in 2012. Sometime later, Leon started dating his assistant Wing, who also used to manage Aarif Rahman (李治廷). Their relationship was revealed only after the Hong Kong media revealed that Wing was several months pregnant. Though Leon and Wing are not married, sources say Leon has been sharing his finances with Wing, and the couple are living together.